Tuning gone wrong is a tribute to those backyard tuners, the budget wrench turners who see a car and say “I can make it better” and then fail miserably. This time around, however, we are in a bit of a “sticky wicket”. 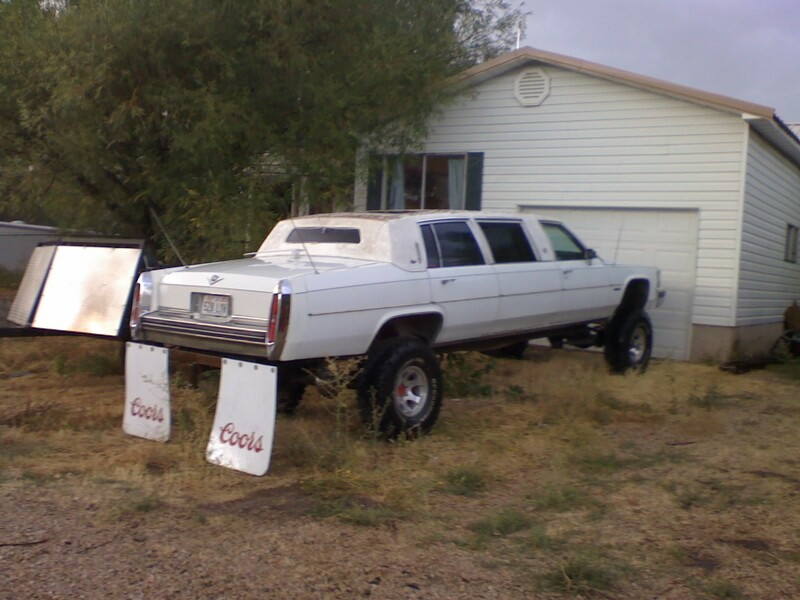 We’re stuck in a debate on if this redneck limo is actually cool or hilariously inbred. We can’t decide either way. What do you think? Let’s break it down. This double-take worthy 80′s classic limo has a hint of class with a touch of rugged charm. First off it has the classy Cadillac stretched body, a car I personally dreamt of riding to elementary school in. But then they made it better (or worse?) by dropping the body on a lifted Suburban chassis giving it full four-wheel-drive capability. The knobby tires and 12+ inches of clearance may suggest redneck, but it’s the giant mud flaps flanking the rear of this vessel that scream “I love my cousin, physically”. Last I checked “Coors” doesn’t sponsor any operas, ballets or anything else you might commonly see a “classy” limo at. But, this isn’t your common limo I guess. AJ on October 13, 2010 at 8:35 pm. Whoah buddy, good luck getting to second base in that thing. Even if your sister isn’t discriminating, it’s still an eyesore. This is the kind of thing I would expect to see in the Arizona desert with bullet holes and without wheels. Chad Waite on October 13, 2010 at 8:59 pm. Oh my. They don’t make um like they used too, eh? Ben on October 13, 2010 at 9:12 pm. I love the Coors mudflaps. I wouldn’t expect anything less. Brandon on October 14, 2010 at 4:00 am. I actually found this “beauty” in the little town of Wallsburg, Utah. No better setting for such a “unique” vehicle. StephAnn Knotts on October 14, 2010 at 7:11 pm. Bob on October 7, 2015 at 4:40 pm.